Canned mushroom are made from fresh mushroom by trimming, washing, and sorting and stored into sealed container. Specific temperature or heat is provide to these to assure preservation of the mushrooms. Canned mushrooms contain high quality protein and essential nutrients, which are an important part of a healthy diet. Canned mushrooms provide nutrients ranging from protein, B vitamins and vitamin C, fiber, calcium, and minerals. Salt or monosodium glutamate and ascorbic acid is added to these mushrooms to improve its shelf life. Canned mushroom offer several benefits such as low calories, low-sodium content, fat-free and cholesterol-free, which is vital for healthy cognitive functions and immune system. Furthermore, mushroom has anti-aromatase activity, which inhibit aromatase enzyme. Aromatase enzyme produces carcinogenic agent called estrogen, which stimulates growth of the hormone-receptor-positive breast cancer cells. Canned mushroom reduces the risk of developing cancer, which is driving growth of the market. According to the World Health Organization (WHO), cancer is a leading cause of death worldwide accounting for 8.8 million death cases due to cancer in 2015. The most common cancers are lung, breast, colorectum, and prostate cancer. However, availability of various alternatives such as dried and frozen mushrooms are expected to drive growth of the market. According to a Coherent Market Insights’ study, global canned mushroom market was valued at US$ 9.7 billion in 2017 and is expected to witness a robust CAGR of 4.6% between 2017 and 2025. This significant growth in the canned mushroom market due to rising consumer awareness about nutritional value and health benefits of mushroom across the globe. For instance, according to National Horticulture Board (NHB), protein in mushroom has high digestibility around 60-70% and it contains amino acids used as a healthy food. Furthermore, canned mushrooms are available throughout all the seasons of the year. Therefore, this is another major factor driving growth of the market. 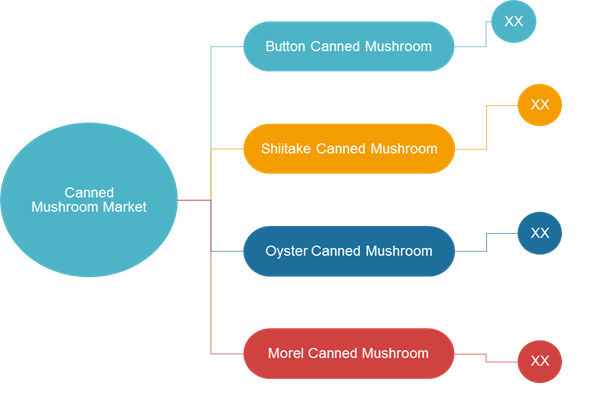 On the basis of product type, button canned mushroom segment is expected to witness significant growth in the market, due to rising demand for button mushroom in the market. According to The Agricultural and Processed Food Products Export Development Authority (APEDA), large scale of white button mushroom production is mainly centred in to Europe, North America, and Asia Pacific. For instance, according to Indian Council of Agricultural Research, total mushroom production in India was valued at 0.13 million tons in 2017 with average growth rate of 4.3% from 2016. Out of total mushroom production, white button mushroom share was 73% followed by oyster mushroom (16%), paddy straw mushroom (7%) and milky mushroom (3%). North America canned mushroom market was valued at US$ 2.6 Billion in 2017. The U.S. held major market share in the North America canned mushroom market. High production and consumption of processed mushroom such as canned mushroom is increasing in North America and this is expected to positively impact on the total canned mushroom market. For instance, according to U.S. Department of Agriculture National Agricultural Statistics (USDA), in the U.S., total mushroom market was valued at US$ 1.2 billion in 2016 with production of different mushrooms including varieties such as oyster mushrooms and shiitake grew by 4% from 2015 and reached to 25.4 million pounds with a sales value of US$ 92.6 million in 2016. Canned mushrooms provide nutrients ranging from protein, B vitamins and vitamin C, fiber, calcium, and minerals. Salt or monosodium glutamate and ascorbic acid is added to these mushrooms to improve its shelf-life. Mushroom are marketed as a fresh, dried and preserved. Canning is the process of preserving mushroom pieces in butter, brine, oil, vinegar etc. It involves basic operations such as cleaning, blanching, sterilization, cooling and labelling. Increasing consumer preference towards healthy and protein enriched food due to its Nutritional value is expected to aid in growth of the market. Mushroom are potential substitute of muscle protein on accounted of their high digestibility. For instance, For instance, according to National Horticulture Board (NHB), protein in mushroom has high digestibility around 60-70% and it contains amino acids used as a healthy food. A major restraining factor for growth of the market is availability of alternatives such as dried and frozen mushrooms. Canned mushroom market in Asia Pacific is expected to witness rapid growth registering highest CAGR during the forecast period, owing to demand and production of edible mushroom in emerging economies such as China and India. For instance, according to China Edible Fungi Association (CEFA), edible mushroom production (Dried, salted and Canned Mushroom) was valued at 34.6 million tons in 2014 and expected to reach at 48.9 million tons by 2018, representing a CAGR of 9.1%. By region, North America and Europe held significant market share in the global canned mushroom market. 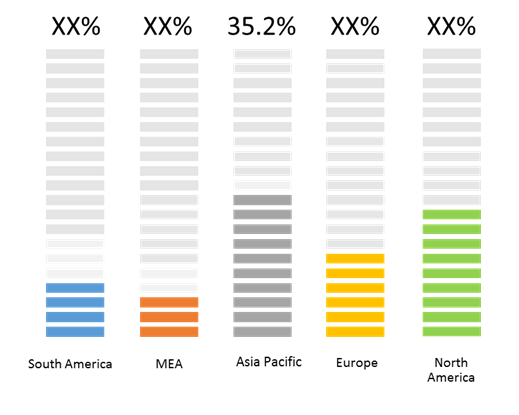 Asia Pacific held a major market share of 35.2% in 2017. It profiles leading players in the global canned mushroom on the basis of the following parameters – company overview, financial performance, geographical presence, product portfolio, key developments, and future plans. * Browse 150 market data tables* and 90 figures* on "Canned Mushroom Market” - Global forecast to 2025.